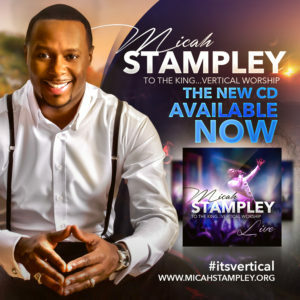 International worship leader Micah Stampley has been imbedding the stamp of The Lord within people on five continents over six amazing albums. His eighth recording, To The King: Vertical Worship on Interface Entertainment, distributed by eOne, marks another scintillating chapter in the Stellar and Dove Award-nominee’s incomparable music mission. Micah subtitled the project “Vertical Worship” because the 12 praise and worship milestones within are primarily written not “about” God but TO Him—divinely inspired with wraparound global appeal. Collaborating with his anointed songwriter wife Heidi Stampley, musical director Cameron Sankey and Jeshua “Tedy P” Williams (co-producer of four songs), the man who started his career with Bishop T.D. Jakes has delivered a live album encompassing 360 degrees of God’s mighty power—hits, hymns and new gems…from a whisper to a roar! Saving the best for last, Micah closes To The King: Vertical Worship with a one-two punch of dynamism: the brand new intimate prayer serenade “Glory to The Lamb” and the hair-raising ASCAP Award-winning “Our God.” On the origin of the former, Micah shares, “I woke up one morning about five to a text from Tedy P that read, ‘OMG! God had me up since two in the morning with a song. Check your email!’ I put my headphones on—Heidi was still asleep—and heard Tedy playing a melody. Though he can’t sing a lick, he told me, ‘Whatever you write, include this phrase at the end: Glory Hallelujah to the Lamb.’ The hairs on the back of my neck stood up and I literally fell to my knees, weeping. I had been searching for something intimate and passionate. This was it! I shared it with Heidi and she started speaking in tongues! Driving to Tedy’s house an hour later, God started giving me the words. I was singing into my phone. ‘There’s so much I want to tell you/It’s like I’ve lived a thousand lives…’ The three of us sat in Tedy’s studio, going back and forth, and penned that song in 15 minutes!” It builds from a powerful piano accompanied solo vocal to a glorious climax that explodes into “Our God.” Micah stretches one note into infinity then is later joined by Atlanta worship leader Sha Simpson for the big finish. Briefly, Micah pursued dreams of R&B/pop stardom. “Every time I did,” he recalls, “it was shut down. So I happily decided to just lead worship in church.” On a visit to Louisiana, Micah met and married registered nurse Heidi Jones in 1998 gaining both a matrimonial partner and songwriting partner. “Then T.D. Jakes’ associate Marcus Dawson filled in for music ministry at my church in Houston, heard me and told the Bishop. I got snatched up and wasn’t even trying!” While signed to Jakes’ Dexterity Sounds label, Micah developed a contemporary gospel and praise style that earned him critical acclaim and a fast-growing fan base. His 2005 debut CD, The Songbook of Micah (produced by Cedric Thompson) became the second highest Gospel Chart debut (at No. 3) for a male vocalist at the time thanks to “War Cry” and “Take My Life.” He was a Stellar Award nominee for Male Vocalist of the Year and New Artist of the Year. The CD was reissued by EMI Gospel in 2006 as The Songbook of Micah: Deluxe with Remixes. In 2006, Micah came back strong as he and Heidi started their own label, Levitical Records, to release A Fresh Wind: The Second Sound which yielded “I Believe” (the video was No. 1 for six weeks on the Gospel Music Channel) and “Another Place,” the gorgeous flute-kissed “You Are Lord” and duet “Call to the Nations.” This resulted in two 2007 Stellar Award nominations: Contemporary Male Vocalist of the Year and Praise and Worship CD of the Year. Micah’s fourth album, Ransomed (released on the Stampley’s renamed Interface Entertainment company in 2008) featured the hits “Corinthian Song,” “Lend Your Song To Me” and a gem from the pen of one his greatest inspirations: “Always Remember” by Andraé Crouch. With a newfound goal to further broaden his audience within Contemporary Christian Music, Micah tailored 2011’s One Voice to that audience with exciting new sounds like “Hosanna” and “Shout,” peaking at No. 5 on Billboard’s Top Gospel Albums chart. “Desperate People” also bowed on this album and remains a major request in Africa and the U.K. That year The Stampleys also produced the television special “Answering the Call of Love,” which aired on several Christian networks. 2013 saw the eagerly anticipated sixth CD Love Never Fails (Micah’s first for Motown Gospel), produced by Micah (co-produced with Aaron Lindsey), and for which he and Heidi composed six of the eleven tunes. Highlights include the phenomenal “Our God” (an ASCAP Award winner and Top 10 charter produced by Asaph Ward), “How He Loves Me” (featuring Reggae star Chevelle Franklin and very popular in Caribbean), “We Will Praise You” and the title track. This yielded Micah Dove Award nominations for Contemporary Urban/Gospel Album of the Year and Contemporary Urban/Gospel Song of the Year. The success of all this music resulted in much world touring including intensive popularity in Africa from Cape Town and Johannesburg to Nigeria. Coincidentally, among the most fascinating blessings of Micah’s life was being adopted by His Royal Majesty Drolor Bosso Adamtey I—King of the Se’ (formerly Shai) kingdom of Ghana, West Africa—in a 2008 ceremony attended by dignitaries, power players and media from around the globe. The adoption made Micah a Prince. The two men met when Micah was asked to be music minister over a luncheon in Riverside, California. The King was profoundly moved, speaking prophetic words over Micah and Heidi before all present. The King, who had two daughters, had been praying for a son. God stepped in blessing the king and Micah with the desires of their hearts. Two years later, the King sent for Micah and Heidi, spending a weekend laying out his royal design. The Fruit of The Spirit is bountifully revealed within Micah Stampley’s To The King: Vertical Worship.